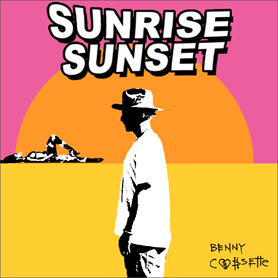 World-renowned as an influential and in-demand GRAMMY® Award-nominated producer with credits as diverse as Kanye West, The Band Perry, John Legend, Miguel, and The All American Rejects, Benny Cassette continues to simultaneously evolve as an artist in his own right. Today, Cassette announces his debut single “Sunrise Sunset” from his anxiously awaited full-length debut album Broken Hearts And Dollar Signs, due out later this year. Stay tuned for the “Sunrise Sunset” music video premiering in April. A born storyteller, Cassette quietly assembled the Broken Hearts And Dollar Signs album while traveling around the world. During his travels, he penned a series of letters addressed to those closest to him—everyone from old flames (inspiration for “Sunrise Sunset”) to his beloved grandmother. Now, each letter inspires its own song on the tracklist. Signed and sealed with his inimitable production, he delivers these songs with impassioned vocals and raw lyricism. He’ll unravel this narrative over the course of the next six months, debuting one music video per month until the record’s release.